Welcome to the Lewiston Farmers' Market! Welcome to the Lewiston Farmers' Market. We are so happy you stopped by to learn more about us! A family-friendly farmers' market right in the heart of Lewiston-Auburn, the Lewiston Farmers' Market offers visitors a chance to connect with one another and shop for a wide variety of fresh, delicious local foods and goods. Conveniently located near the beautiful Great Falls and the historic Bates Mill 5 the summer market occurs every Sunday from 10 am - 1:30 pm. The 2019 summer market will open early to mid MAY (date still to be determined) and operate until Sunday, October, 27th. Each week the market hosts local and live music along with kid-centered activities including a Kids Club that offers opportunity to taste fresh fruits and veggies and even buy some from the market! See below for our events and activities page or visit our FACEBOOK page. In the winter time you can find the Lewiston Winter Farmers' Market at the YWCA at 130 East Avenue from November through February. For more information on the winter market visit our winter market page! 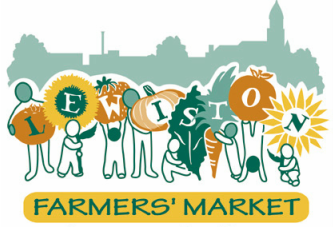 The Lewiston Farmers’ Market is sponsored by St. Mary’s Nutrition Center; a local and statewide resource dedicated to promoting community health through organizing, advocacy and education. ﻿Curious about the people and products you'll see at the Market? Click below to find out more about our weekly and guest vendors! We host weekly musicians and a Kids Club at the market! For more information click the button below! For special events visit our FACEBOOK page! Get BONUS fruits and vegetables when you use your SNAP/EBT on any food product at the Lewiston Farmers' Market!